Once you’ve defined your request attributes, you can go to any service page where you expect to see your defined request attributes. Have a look at the Top requests section (see example below). The respective requests contain attribute labels indicating the defined request attributes. Click any request attribute to filter the entire page view down to only those requests that carry the selected attribute. This includes both the chart at the top of the page and the request table further down the page. Any further analysis you do will be likewise focused on these same requests. 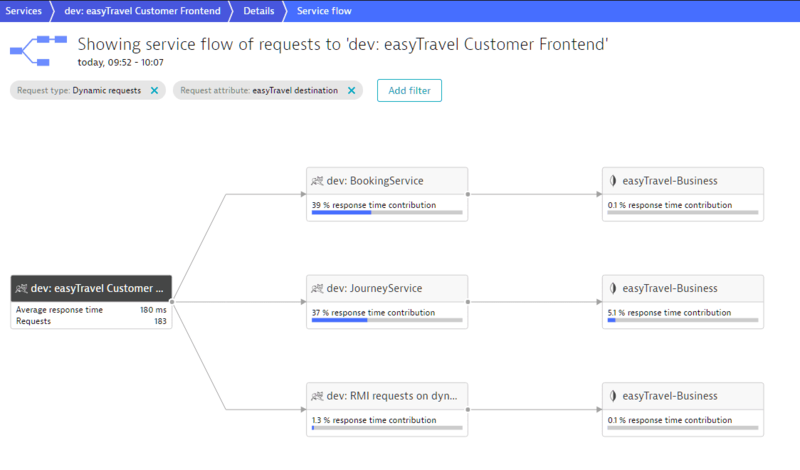 Service flow only shows those requests that contain the easyTravel destination request attribute. 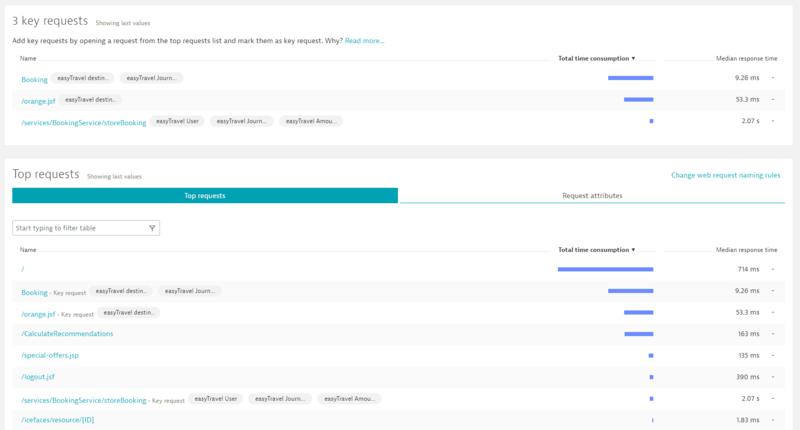 A Request attributes tab is available next to the Top requests section. This tab lists the request attributes that correspond to the request page. 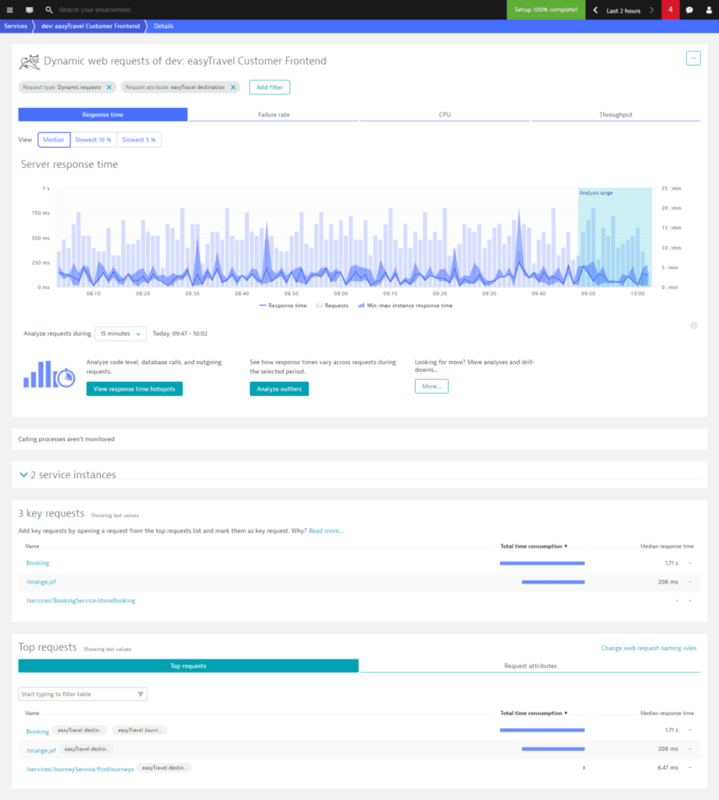 The results reflect the current filter settings and shows the same metrics as the request table. In the example below, you can see a list of four request attributes. The Median response time is the median response time of all requests that contain the request attribute. The Total time consumption represents the sum of response times of all requests in the selected timeframe that have the selected request attribute. You can also view the corresponding throughput metrics. In the example below, there were 2,400 requests that dealt with easyTravel JourneyId and the current throughput is 16/min. Request attributes do of course have values. You can see the values by expanding any attribute row. The table below shows the throughput numbers for all requests that contain the easyTravel destination attribute, sorted into the Top 18 values. Here again, you can click any request attribute key/value pair to narrow down the results on the page to just those requests that include the selected attribute value. For example, the chart below only shows those requests that have the attribute key/value pair easyTravel destination = Zurich. 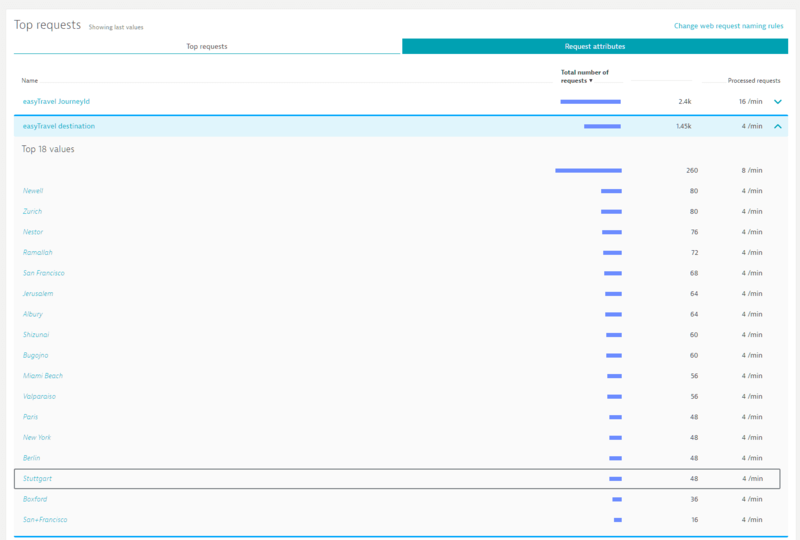 Request attributes can be leveraged across all service analysis views. 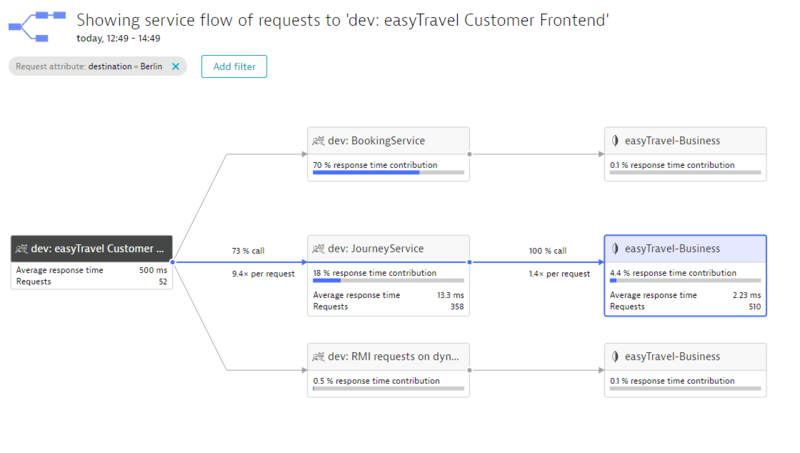 The service flow below shows the transaction flow of 52 Requests. 73% of the requests make about 10 calls to JourneyService. The service flow is filtered by the request attribute key/value pair destination = Berlin. This means that all 52 requests on the easyTravel Customer frontend service have a request attribute destination with the value Berlin. This filtering approach works across all levels of all service analysis views.